Every game on this list served as a balm for the depression cave that I lived inside throughout 2017. I’m pretty sure these games happen to be good even if you’re not depressed, since most of them popped up on my coworkers’ own best-of lists, but I had such a dire need for escapism this year that I found myself evaluating every experience through that grim lens. If you struggle with depression, then you should read the content warnings for this game. If you don’t, you may or may not consider the content warnings to be “spoilers.” If you don’t want to know anything about this game ahead of time, please skip the rest of my description of this game. DDLC depicts a series of graphic suicides. That’s a spoiler if you’re someone who would only enjoy this game on the merits of the horror “twist,” which is that what appears at first to be a cutesy dating sim is actually a meta-fiction about high school girls who realize they’re stuck inside of a game. The additional meta-horror for me, though, was having the experience of a helpless onlooker who doesn’t know how to respond to their friend’s depressive episodes, existential crises, and suicide ideation. I expected not to like the game’s treatment of suicide and depression. I tend to find such plotlines tiresome and reductive. I hated the suicide storyline in Life Is Strange; in that game, the protagonist can use her time travel super-powers to say the exact right words to prevent a character’s suicide. 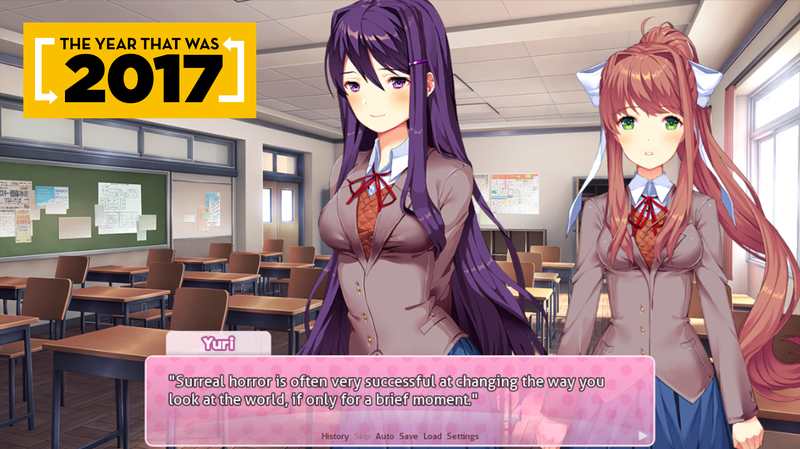 In DDLC, though, there are no perfect responses. You can’t just reload the game and get the ending you want. Not without first facing the reality of the girls’ trauma. The game’s surface level reading seems to comment upon the inherent creepiness of characters designed to fall in love with the player no matter what, and the sense of doom they then feel about that. But for me, the game had an additional layer of horror that comes from feeling helpless in the face of depression—be it your own, or a friend’s, or both. There’s an in-universe explanation for why the girls of DDLC have been plagued with suicide ideation, and you can even get the satisfaction of “fixing” them, if you look up the complicated method by which the “best” ending can be unlocked… but their initial trauma stays with them, and with you. There is some dark comfort in seeing a mirror held up to the secrets you bury inside of yourself. There are some system files in my brain that I’d like to be able to delete. The only way to do something like that is to actually witness and process your trauma, and to then discover the programs your brain uses to sideline you. The memory of the trauma doesn’t go away, but you can find methods for stopping the pesky subroutines that keep you traveling down the same dark paths. Robots and androids in science fiction often serve as a stand-in metaphor for marginalized identities, and usually, these stories end up being about assimilation. The Vision in the old Avengers comics, for example, or Data in Star Trek, got saddled with the experience of being the only android on their respective teams, as well as an impossible longing to become human and “fit in” with their peers. It’s rare that we see stories of robots and androids hanging out with each other and navigating the difficulties of their own existence, and also, debating whether or not they should be aspiring to be like humans at all, and what that would even mean. That’s what Nier: Automata does. Nier: Automata gives us plenty of android and robot teamwork, as well as complicated infighting, and it also raises uncomfortable questions about the distinctions they have drawn between one another. Why did humans build androids that look like them, and that look in these specific ways? What is beauty, what is it to be human and to feel love? By extension, what does it mean to have any attachment to artificial life—or fictional life, such as these characters in a video game? Many science fiction stories about robots raise these same questions, but Nier: Automata has far more haunting brain teasers to present to you, such as an eventual fourth wall-breaking encouragement of the player to question the extent to which the characters in the game get to call themselves “real” and assert their livelihood. This small, spooky game about artificial intelligence tackles the usual “what even is humanity” topic, but through the lens of a human being whose job it is to delete a series of seemingly sentient beings from four different hard drives. The game has an unsatisfying and sad conclusion no matter what choices you make, since the directive that you’ve been given appears to be immoral. Also, the AIs that you can choose to help have decided to cut their own moral corners in order to survive, so rebelling against your new boss and saving them might not feel like the “right” choice, either. The game does a lot with a little; most of the game’s emotional weight gets shouldered on the timing of the text crawls, as well as the haunting soundtrack. Fullbright’s latest game has the same solitary exploration vibe as Gone Home, but the game’s sound design and music elevated it far beyond its predecessor. The comforting clicks of machinery and whooshing airlock sounds made Tacoma’s world feel all the more immediate and tactile. The loneliness of space can feel spooky at times, as the game intends, but as a longtime Metroid fan, I find comfort in the sensation of exploring a space station all by myself. Combing through a room from top to bottom and clicking on every last item also gave me a sense of completion that soothed my sad brain. Over the course of my lifetime playing competitive games, especially fighting games, I have gone from being a very sore loser to being, well, not that. This year, I also learned how to meditate. Also this year, Getting Over It With Bennett Foddy offered me the experience of extreme frustration but, at the same time, the chance to practice getting back up again. I felt a sense of peace while playing this game. It’s like meditating on hard mode. I often describe the experience of playing StarCraft as “relaxing,” which might make sense now that you’ve read my thoughts on Getting Over It With Bennett Foddy. If you play a game enough times, especially a competitive game with specific memorized strategies like StarCraft, you can enter a type of mindless autopilot that feels soothing and meditative. Furthermore, this remaster of the game reminds me of how cool Kerrigan used to be before StarCraft II: Wings of Liberty did her so wrong. There’s plenty that turns me off in Madden 18, such as its card-collecting mechanics that allow you to create a statistically ideal football team using the same predatory tactics as loot boxes. However, this year, Madden 18 also included a story mode that hit all the right emotional beats for me. It’s a story about trying, and failing, and trying again… and again… and again. It’s about being in over your head but wanting to fulfill a dream anyway, against all odds, and in the face of all the people who told you that it wasn’t possible. This game made me cry. I cried about football and dashed dreams. “Longshot” is saccharine and straightforward, but it far exceeded my expectations. Remember that animation when Link puts a lot of ingredients into a pot and watches them transform into a meal? Sometimes it’s a simple meal, like a baked apple or a mushroom skewer. Sometimes it’s a complicated stew of spices and meats and complementary flavors. Every time, Link’s face lights up with a glow of joy and pride. He made this food. He collected the ingredients in the dark, in the rain, in the midst of monster-riddled hills. And now, he’s going to eat it all and grow stronger. I helped Link make meals over and over in 2017. When I’m depressed, I forget to eat, or worse, I lose my appetite entirely. Link brought my appetite back again. Mushroom skewers and baked apples taste delicious. As a former worshipper of tier lists, it makes sense that I would fall into the rabbit hole of Mario Kart spreadsheets this past year. I have always found comfort in the idea that a game can have a “best” strategy, although the answer always turns out to be far more complicated than that. I didn’t realize until this year that Mario Kart has its own tiny but devoted competitive following with their own fan-run World Cup and their own ideas about which karts work the best for different situations. I got better at Mario Kart this year, and I had a lot of fun doing it, but most importantly, this game and its extensive fan documentation served as yet another brain-consuming distraction for me during dark times. Given the extent to which I waxed poetic about Samus as soon as this game got announced, it should come as no surprise that this game would appear on my top ten list. This remake of Metroid 2 doesn’t break any major ground with the series, but that’s exactly why I liked it so much. It feels safe, like a rose-colored memory of a game I already enjoyed, done up the way I’d imagined it in my mind. I had an experience with this game that I almost never have in my adult life anymore: the sensation of entering a void in which time ceases to exist. Hours and hours would go by, with my brain succumbing in full to the experience of exploring caverns and poking through every last nook and cranny. It felt like going home again.